Anyone who hopes to practice medicine in the United States must pass the United States Medical Licensing Examination, or USMLE. (The only exceptions are graduates of osteopathy programs, who can pass either the USMLE or the COMLEX.) The test is actually a battery of three separate tests, known as Step 1, Step 2, and Step 3, and a candidate must pass all three steps in order to qualify for medical licensure. The purpose of the tests is to ensure that physicians are competent and highly qualified before they are granted a license to practice medicine in the US. Graduates of foreign medical schools are eligible to take the USMLE, but procedures for doing so are a bit different than for graduates of US or Canadian medical schools. 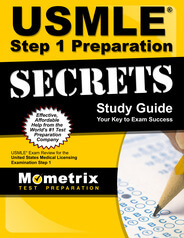 Prepare with our USMLE Study Guide and Practice Questions. Print or eBook. Guaranteed to raise your score. Get started today! Step 1 is commonly regarded as being the most difficult of the three tests. In most cases, a candidate will take the Step 1 after finishing the second year of medical school. A passing score is currently 188, while the average score is currently 225. The score from Step 1 is not only for licensing purposes, however. When it comes time to apply for a hospital residency after graduating from medical school, students will find that their score will be a big factor in determining where they wind up. The more elite residency programs will naturally favor students with higher Step 1 scores; indeed, it’s widely believed that the score is the single biggest factor residency program directors consider when making their decisions. The exam covers anatomy, physiology, biochemistry, pharmacology, pathology, microbiology, behavioral sciences, and several other lesser topics. There are 280 multiple choice questions, divided into seven blocks, and the test will take around eight hours to complete. Step 1 is designed to measure a candidate’s knowledge and understanding of medical topics and practices. USMLE Flashcards. 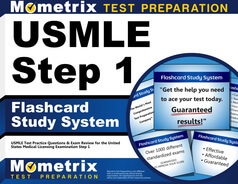 Proven USMLE test flashcards raise your score on the USMLE test. Guaranteed. Step 2, however, is designed to determine how well they can actually apply their skills and knowledge in actually caring for patients, under the supervision of a licensed doctor. It is actually two separate tests, given over two days. The first is known as Step 2-CK, and assesses a candidate’s knowledge in such areas as surgery, pediatrics, psychiatry, etc. There are eight sections on the CK exam, and each one has 44 multiple choice questions, and it takes around nine hours to complete the entire test. The other exam is known as Step 2-CS, and it also is a daylong affair. During this exam, the candidate will exam a dozen “patients” (actors posing as medical patients following a script). For each patient, the test taker will have 15 minutes to take a history and give a medical exam, and 10 minutes to write up possible diagnoses , recommended tests, and other information. Step 2-CS is only given in five cities (Philadelphia, Chicago, Atlanta, Houston and Los Angeles) and is usually taken during the fourth year of med school. Step 3 is a two day exam that measures a candidate’s ability to apply their medical knowledge and skills on their own, without supervision. This exam can only be taken after a candidate has passed Step 1 and Step 2, and awarded an MD upon graduation from medical school. On the first day of the exam, there will be 336 multiple choice questions, divided into seven blocks of 48 questions, with an hour allotted for completion of each block. Day will have 4 blocks of 36 multiple choice questions, with each one allotted 45 minutes. In addition, test takers will “treat” nine “patients” by real time computer simulation, with 25 minutes allotted for each simulation.